Similar in taste to molasses, this sweet syrup is made by squeezing the green juice out of the stalks of Sorghum cane and boiling it until it thickens. Peek in the pantry of any South-loving cook and you’re likely to find Sorghum. Known for its depth and wide range of flavor, this sweet syrup is like the first cousin of molasses. Unlike molasses though, it is not a by-product of another process. Sorghum is made by squeezing the green juice out of the stalks of Sorghum cane and boiling it until it thickens and becomes golden.We consulted our resident Southern Grandmother and she told us that when she was growing up in the mountains of North Georgia, there was a man who had all of the equipment needed to make sorghum from start to finish and he’d venture from house to house, using the crops from each farm to fill dozens of jars that the family would put away to use throughout the year. The town knew that this was happening not by the sight or sounds of heavy machinery, but rather by the sweet, hunger-inducing smells that wafted throughout the town as the sweet juice boiled. She also said that children would take leftover biscuits from breakfast, poke a hole in the top of them, pour sorghum into that hole, and bring this treat to school for a snack. Sorghum Syrup is good in or on almost anything that you’d like to sweeten. Some of our favorite uses for Sorghum syrup include pumpkin pie, sweet potatoes, baked beans, and baked apples. Don’t be afraid to use liberally as Sorghum syrup is one of the most nutritious sweeteners. In fact, before the invention of modern-day vitamins, doctors would prescribe Sorghum syrup as a daily supplement for those they believed to be malnourished. When PeachDish ships Sorghum, we always use Muddy Pond Sorghum Mill Sorghum. A favorite brand of those rare, still operating general stores, Muddy Pond sells 100% pure sorghum with no additives. The Muddy Hill Mill is located between Nashville and Knoxville in the hills of Tennessee, and if you visit during September or October you’ll catch them making the syrup. We feature Muddy Pond in our latest dish, Sorghum Glazed Turnips, Parsnips, & Pears with Farro. Craving more Sorghum? 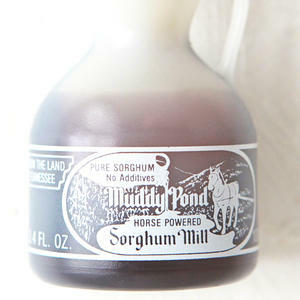 Order Muddy Pond Sorghum Mill Sorghum through our online store.